Napeague State Park, at left. 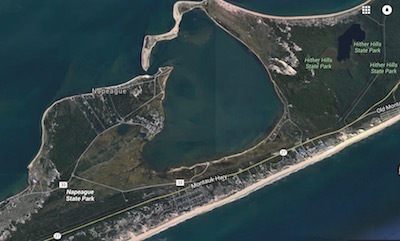 New York State Assemblyman Fred Thiele announced in late June that the state will be awarding $150,000 for improved hiking access and trails in the undeveloped 1,364-acre Napeague State Park, between the Atlantic Ocean and Gardiners Bay. The state park is just west of Lazy Point and Napeague Harbor, and is the site of the former Smith Meal menhaden processing plant along a stretch of Gardiners Bay bayfront known as Promised Land — a place of much industry during the heyday of the menhaden fishery. The parklands, acquired by The Nature Conservancy in 1976, were transferred to the New York State Office of Parks, Recreation and Historical Preservation in 1978. The state funding is part of a total of $1.3 million earmarked for 17 projects as part of the NY Parks 2020 Plan to expand opportunities for outdoor recreation. The NY Parks 2020 Plan is a multi-year commitment to leverage $900 million in private and public funding for state parks from 2011 to 2020. New York State is also launching the Connect Kids to Parks program, to enhance educational and recreational opportunities for schoolchildren and help promote parks and historic places in every corner of the state. As part of that effort, New York will partner with the National Park Service to extend free State Park day-use entry to all fourth grade students and their families in 2016, as well as create a grant program to help transport schoolchildren to outdoor recreation and environmental education programs at state parks and historic sites across the state.